OMG! SUCH exciting news! The lovely Wendy who blogs over at Noodling With Words submitted #PPBF to WriterUnboxed and they accepted it for sharing! Look! Parents, teachers, writers looking for picture book recs? Check out the hashtag #PPBF every Friday. Thx for the head’s up, @WendyGreenley! I am embarrassingly bad at twitter, although I’m really trying to get better at it, but now I must really make an effort to remember to use our PPBF hashtag! 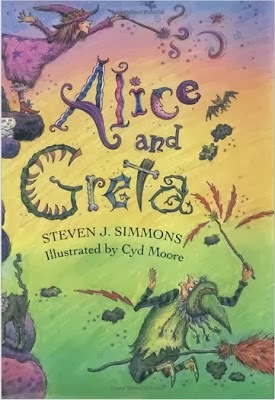 Why I Like This Book: This book has a fun story about two little witches, and a nice message about reaping what you sow 🙂 It’s full of spells and enchantments and mischief. But it’s the delightful art that takes it over the top for me. The drawings are full of fun details that kids can spend lots of time looking at and that bring the story so appealingly to life. First Prize is a PB Critique from the amazing Corey Rosen Schwartz, author of The Three Ninja Pigs, Hop! Plop!, and the forthcoming Goldirocks, Ninja Red, and What About Moose? AND a copy of Linda Ashman’s new Nuts And Bolts Guide to Writing Picture Books (your choice of e-book or PDF)! Second prize is a PB manuscript and query letter critique from talented author Heather Ayris Burnell, author of Bedtime Monster. The 3rd Annual Halloweensie Contest – aahhhrrrooooOOOOO! !